NobleProg, as an official member of OMG, delivers various OMG exam preparation courses across the world and arranges the exams for you. Object Management Group (OMG) is introducing major changes in most important certification paths. OMG Certified UML Professional Certification (OCUP) and OMG Certified Expert in BPM Certification (OCEB) are replaced with new versions OCUP2 and OCEB2. OCUP 2 is based on the newest version of UML 2.5. 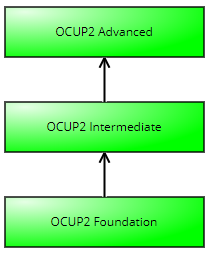 Old OCUP has been completely replaced with OCUP 2. The examination was extended by additional topics- chapters Why We Model and a State Machine Diagram. New questions are much more oriented to the practice of modeling than the UML metamodel, as it was in the first version of OCUP. For now just two exams have new versions OCEB 2 Fundamental (OMG-OCEB2-FUND100) and OCEB 2 Business Intermediate (OMG-OCEB2-BUSINT200) - published on 14.11.2014. 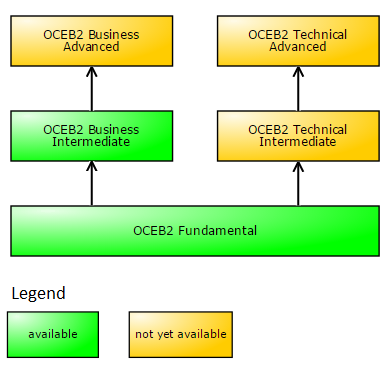 New OCEB2 versions are based on BPMN 2.0. Certain issues have been refreshed and expanded. NobleProg has official OMG OCUP 2 Content Developer status, which means that our course outlines and training materials were developed by the same experts who prepared questions for OCUP 2 exams. Two people from NobleProg team take an active part in the work of OMG, which deals with determining the subjects of OCUP 2 examinations and creating test questions. Our article, Concurrency in UML, was listed by OMG as a part of reference list to prepare for the OCUP 2 Foundation exam. NobleProg has official OMG OCEB 2 Content Developer status, which means that our course outlines and training materials were developed by the same experts who prepared questions for OCEB exams. Two people from NobleProg team take an active part in the work of OMG, which deals with determining the subjects of OCEB 2 examinations and creating test questions. 1. If person who has no Foundation level exam passed can take an Intermediate level exam? 2. If person who already passed old version of Foundation level exam can take a new version of Intermediate level exam? No. Examination path need to be started all over again.